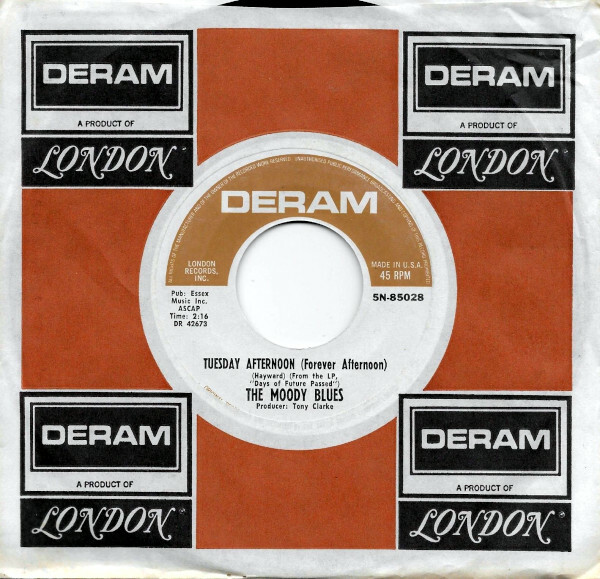 Just as Days of Future Passed was disappearing from the charts in the Summer of 1968, Deram released “Tuesday Afternoon” as a single–mere weeks before the Moodies’ next album, In Search of the Lost Chord. As a result, its success in the US drowned out “Voices in the Sky,” although I’ll take “Tuesday Afternoon” any day. The song is essentially Justin Hayward’s rewrite of The Beatles’ “A Day in the Life,” even down to its influence (both appear to have been inspired by a smoke), with some brilliant accompaniment from Mike Pinder and John Lodge. The fade is awkward, since the song wasn’t originally mixed as a standalone piece, but it’s two minute of sunlit heaven nonetheless. The B side is Ray Thomas’ “Another Morning,” one of his typically childlike works and featuring a very different musical arrangement from the band, with Thomas’ flute prominent in the mix, playing the role of Pied Piper in residence. There is some conjecture as to when this single was released; most ascribe it to May through July. The single is first referenced in the July 1, 1968 issue of Billboard and reached the lower charts (#138) the following week, so I’m guessing June, on a Tuesday. Released on 7-inch in June 1968 in the US (Deram, 45-85028) and Canada (Deram, DM.85028); reached #24 on the US charts. Also released as a promotional 7-inch in Argentina (Deram, DM-1028). Re-issued on 7-inch single in January 1971 in France (Deram, 333.002) with picture single. Re-issued on 7-inch single in 1974 in the US (Deram, 5N-85028). Re-issued on 7-inch single in November 1989 in the US (Deram, 882 122-7).